The cast of the West End production of Mamma Mia is performing to the Welsh crowds of Sophia Gardens on Saturday 15th September. This one-night outdoor spectacular concert will showcase the smash-hits of ABBA to two thousand excited fans. Ahead of the concert, we asked the questions the fans really want to know! No matter who you are, everyone has the ability to sing the lines from an ABBA song whether they are a fan or not, but what is your ABBA go-to song? My go-to song is very dependent on my mood at the time. I have to say when I’m feeling happy- Voulez-Vous is the song of choice. When I’m feeling a little sad I would sing Winner Takes It All. As a lot of children are currently making decisions about their career paths… What was your dream job at the age of eight and how did you get the calling for the stage? When I was eight I wanted to be a mermaid! At the age of seventeen I managed to fall into the world of theatre. I was lucky enough to play Sophie in Mamma Mia when I was eighteen and I have never looked back since. What’s the largest crowd you have performed to? The largest crowd I have ever performed live to was 60,000 people in Hyde Park for a celebration of ABBA. It was absolutely magical! The largest audience has to be the weekly audience of 8 million for ‘I’ll Do Anything’ show on the BBC. What can we expect on the evening at Sophia Gardens? Expect flares and excitement as all attendees will be a part of one big party. It is an intimate performance to two thousand spectators, so all will be close to the action. 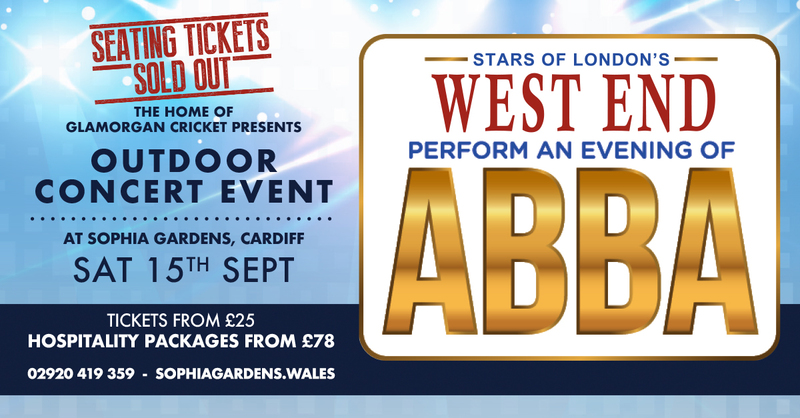 The music of ABBA is so fabulous and the setting of Sophia Gardens will make it even more special!